Maestro 300-Watt Single-Pole Dual Digital Dimmer, White The Maestro Dual Dimmer is a great replacement for stacked switches commonly found in kitchens and bathrooms. It combines the function of two dimmers in one control, but is still packed with all of Maestro's smart features. The easy-to-operate tap switch turns lights on/off to your favorite light level or tap twice for full on. Press, hold and release the switch for delayed fade-to-off. Delayed fade-to-off gives you 10-60 seconds to leave the room or get into bed before the lights go out. Adjust the light level for any activity using the rocker. LEDs display the light level and glow softly in the dark, so you can easily find the control. For use with incandescent/halogen lighting only. Coordinating Claro wall plates and accessories sold separately. 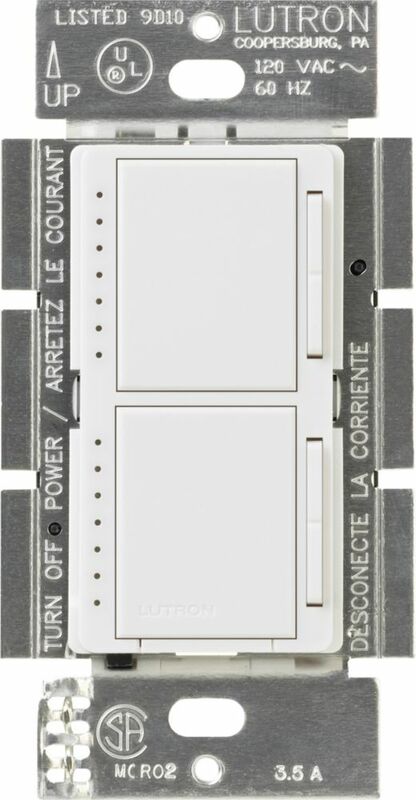 Maestro 300-Watt Single-Pole Dual Digital Dimmer, White is rated 3.2 out of 5 by 18. Rated 1 out of 5 by etrigan63 from Does not work with modern LED lighting.... Does not work with modern LED lighting. Rated 2 out of 5 by eccle from Not worth the cost had issues with the dimmer and my lights were on for days until my electrician could replace. Had to get a different brand. Rated 1 out of 5 by Swonder from Doesn't work with led I installed it a few months ago and the lights on the ceiling fan always flicker when on. There was no indication that it doesn't work with LED as I checked before buying. Thought I would try to find out the problems and read the other reviews. How sad. Rated 4 out of 5 by Isaac from This definitely does what it says - we used it to replace a tandem switch with a tandem dinner. ... This definitely does what it says - we used it to replace a tandem switch with a tandem dinner. Like most dimmers it requires a fairly substantial draw to work correctly, so a single LED lamp may not be sufficient.